One person posted: "I have a Microsoft sticker on the back of the computer with 25 characters. "Doesn't that assure me that the XP version on the CPU [Central Processing Unit] is genuine? Why everything was okay before (for three years) and suddenly I get this from Microsoft..."
"Customers have been crying out for a tool which could tell them if they have been duped," she said. But she admitted that the company could have been a bit more "open and honest" about the pilot tool when it was launched after some users had complained that the tool was "hidden" as part of a security update. In its information for users Microsoft says that "validation failure is almost always caused by the use of a non-genuine Windows licence". "We are 100% adamant that key codes blocked by WGA are illegal," she said. Have you had any problems with Microsoft's anti-piracy tool? How big a problem do you think counterfeit software is? If Microsoft are adament "key codes blocked...are illegal" why did a brand new Packard Bell purchased from PC World not pass? A total shambles me thinks....and they don't appear to want to do anything about it. An attempt to exaggerate the problem so they can legally insist we all have Microsoft spyware on our PC perhaps? I've had problems with this software. I am on dialup and everytime I started up my machine it would automatically dialup a connection despite having my PCs settings set to not automatically dialout. It took a while to find the problem as there was no indication what was trying to access the internet. Perhaps Mr Gates would care to reimburse me for illegally using my phone and the aggravation I have had from my wife who pays the phone bills. As a freelance IT technician, I have experienced my fair share of WGA problems. From a simple error indicating that a legitimate copy is actually illegal (even with the holographic sticker on the side of the machine), to a more general problem of people who do not have broadband. One of my clients has become very frustrated that each time her machine is booted, it tries to dial the internet which she has to repeatedly cancel. We are already seeing swarms of modified WGA downloads available via a simple Google search. This will now make it even more difficult as you don't know if the installed version of WGA is even genuine, let alone the copy of Windows XP itself. I completely understand the need to reduce piracy, but maybe this facility should have been integrated into Windows Vista as standard, rather than causing problems with countless existing systems. Software piracy is a problem, and as I write software myself, I too see the need to protect ones itellectual rights. I do however feel that eventually software will turn to Unix/Linux's approach and be free to use, but paid for via technical support. I have on two occasions when I've had to replace a hardware component due to failure. That said, the Microsoft helpdesk have always got it sorted out quickly for me over the phone and given me an activation code after asking a few questions. Some hardware changes seem to trigger the need for a re-activation which is frustrating. I have had exactly the same problems as some other people. I've got a Microsoft logo on the back of my case with product key and hologram yet I still get the message that my copy of Windows is not geniune. How can this be? This system is designed to confuse unsuspecting and often naive users and scare them into repurchasing Windows. It will not stop the real, tech-savvy pirates, who will just be able to crack the WGA software and continue using their computers without being hassled. Whilst I'm sure many honest people would prefer to be told that their software is illegal, such a heavy-handed approach from Microsoft is uncalled for. This is another example of Microsoft treating all of its users as if they were criminals. Perhaps it would be prudent to give user with invalid windows serials 3-5 chances to enter a valid serial without having to reinstall? I personally have a laptop with an 'illegal' serial installed, soley because the sticker with the valid one is on the underside, and so awkward to reach! Illegal and geniune users are going to circumvent this anyway. "Customers have been crying out for a tool which could tell them if they have been duped" - Why can't Microsoft be honest? I don't know anyone whos is crying out to know if their copy of Windows is genuine. Microsoft just want to crack down on piracy. I think that piracy is a problem, but I believe that if Microsoft were to reduce the price of their software, more people would buy it in the first place. My copy of XP came with my computer, but the retailer didn't include the discs, and despite numerous requests, flatly ignored me when I asked for the discs. When I tried the validation tool last week, it told me that my copy was invalid! What am I - and I'm sure the many others who will have the same problem - supposed to do? BTW, does anyone know what the legal position is when a retailer refuses to give you the discs - which you have paid for? I don't believe for a moment that "customers have been crying out for a tool which could tell them if they have been duped." Customers would want their software to work without a hassle, and I seriously doubt any customer wants a tool that causes them grief, whether it reduces piracy or not. And while MS maybe adamant in their denial, there are plenty of computer-savvy users who report that the software either incorrectly claims they have a pirated version, or fails the authentication entirely and without explanation. I bought a PC in December from PC World and Windows XP came preinstalled. I do not have it on CD and I do not have any codes I might need. What am I and others who buy these preinstalled Windows packages supposed to do? This is exactly what happened to me with a machine that was less than a year old. I took it back to the vendor and they had to rebuild the machine only to discover that Microsoft was at fault. The OS was genuine. 15% success rate is abysmal, don't you think? You have to ask yourself why the timing of this, when they are saying how secure Vista is? Why, if they will be wanting everyone to buy Vista, which they claim can't be cracked, are they suddenly determined to force everyone who they use a flawed set of rules to determine the legitimacy of the product, to buy Windows XP - knowing that the same users are going to be encoraged to ditch XP for Vista less than 12 months down the line? Microsoft, big as they are, are going to have to watch themselves. The draconian Digital Rights Management in Vista, coupled with "crack downs on piracy" and the European anti-trust case could leave the company in serious trouble when it comes to sales. Windows is no longer the only viable operating system out there, and if Microsoft don't realise that, ultimately the big dinosaur will die out while the smaller, faster, more agile one survives! I refuse to install this tool becuase I've already authenticated my copy of Windows XP once. Oh, and maybe if the operating system was cheaper and more stable, more people would pay for it in the first place! My brand new, out-of-the-box Dell computer is telling me that the installation of XP is not genuine ... so much for Microsoft being "100% adamant that key codes blocked by WGA are illegal"
I was aware of this software being part of an Automatic Update from Microsoft but had no idea that my PC would be checked every 14 days; once is enough, surely. In checking legitimate XP machines already validated so frequently what are Microsoft's motives? Isn't this an invasion of privacy and trust. Once a PC is validated, surely spying on customers should not be allowed. We are governed by UK and EU law and I am sure they are using this new software from the USA. Aren't they breaking our data protection and other laws? That's not "quite" true. I have seen two machines owned by separate people broken by WGA - while it will allow you login to the computer, WGA prevents some Windows updates and not others. Microsoft develop their updates with the presumption that certain updates have already been installed. Result: One very unstable machine. Whenever someone comes to me with a machine like this (I am a consultant IT guy) I never bother to re-install XP from the discs provided by the user. I always recommend they go away and buy genuine software from a proper retailer. The problem in this area of Spain is that the ex-pats think they are above the law. Microsoft and a lot of other companies will continue to get tougher and tougher with software pirates, and who can blame them? A couple of billion dollars a year in lost revenue is a hole any company would want to plug. No problems whatsoever and my Windows in genuine. I like the changes Microsoft is making these days, looking forward to seeing what Vista is like. As far as counterfeit software it is a huge problem for companies. I'm glad Microsoft is stepping up to trying to get rid of counterfeit software. I purchased my PC from Dell but it still failed the WGA test at the start of June. The Microsoft website and the on-line help were no-help. I had to pay to telephone the Microsoft helpline who gave me very hard to follow technical advice that resolved the situation - advice that I suspect many non-technical people would have difficulty in understanding. Piracy can be stamped out at source, or at end user level. However if MS are not careful about how they stamp out piracy, many more people will migrate to Linux, which is free to copy and offers equivalent functionality for the majority of users. "Microsoft has also admitted that the tool can cause false positives and that a pass on the system initially could lead to a failure." For a program that costs around £100, that is simply not acceptable. Also for someone who's bought their PC with a Windows licence from a high-street store, then taken it to their local computer shop for a repair, who then reinstall Windows without using the original CD, they won't understand why it's flagged as pirate when they have a genuine licence. Counterfeit software is a widespread problem I think but have personally had no problem with this tool. If the richest software company in the world, with billions of dollars floating around spare and thousands of bugs and vulnerabilities in its products, insists on charging users £70 or more for a home edition of its basic operating system, it shouldn't be surprised if there's piracy. The situation is entirely of Microsoft's own making. 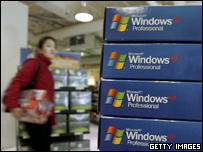 They'd still make a fortune if they charged a tenner for Windows, but the incentive for piracy would disappear. No sympathy. I had a problem with my home pc, after a Windows Update, Windows Genuine Advantage (WGA) popped up saying my copy of Windows was not genuine. It was genuine and as an IT Manager I understand MS licencing only too well. I brought my PC in to work to sort out the problem which, to be fair to MS, only took one phone call (all be it half an hour). They eventually issued a new Windows Key (the 25 character label). 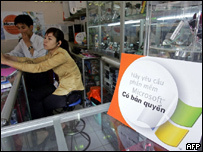 MS may have a problem with counterfeit copies of Windows, but as usual they have taken the sledgehammer solution. Allowing WGA to be put out as a critical update, communicating back to MS without telling the user, is in my opinion, just as bad as the worst spyware. My WinXP kept popping up messages that a important security update was avaiable, but when I looked it turned to be WGA. After unselecting the WGA update, WinXP kept announcing that security updates were available, always being WGA. My WinXP is ok, since I bought it pre-installed on my Dell computer. I do not want to be treated as a potential criminal. Fortunately, I run WinXP dualboot with Linux. No harassment there. Although it might sound paranoid,,I do fee that Microsoft's Windows Genuine Advantage tool is the thin end of a very large wedge. It would be quite easy to modify this piece of software so that competitor's software malfunctions or limits are placed on access to certain areas of the internet. The British government really does need to look into the matter of DRM before we walk into the software equivalent of a Wintel Police State. I've had no problems with it. I've elected not to install it - even though my copy of Windows is genuine - for the very reason that it will probably tell me it isn't and I don't want the hassle. I'm surprised that Microsoft has taken so long to move in this direction. It (and many other software manufacturers) must be losing a vast amount of money to the pirates so why shouldn't it protect its business? If people don't want to pay for commercial products, use Linux and Star Office which are freely available for no charge. I can see no argument against Microsoft seeking to prevent the theft of its new operating system. This is already mandatory. Right now I am unable to download any updates unless I allow it to check (for the third or forth time) that I am running a genuine copy. Once may be okay, twice might have been a bug, but the deliberate continued assumption of guilt is unacceptable. I've had this problem from a secondhand copy that I bought from a shop. It's very annoying as it stopped a couple of programs from working and took me over 3 hours to remove. If Microsoft can up load this tool onto our PCs without our knowledge what else are they liable to send to our PCs as a update. I have deactivated the automatic update for this reason. I dont want Microsoft adding things to my PC I don't want. I have on several occassions considered changing to a Mac. Maybe it is time to change before Microsoft sends out a tool to take control of our PCs to use the spare processing power for resale or even monitor the websites we visit by accessing the temporary internet files. I had a laptop trashed by the install disk that Microsoft sent after I paid up as a result of WGA. I now intend to sue Microsoft for (a) fraudulent misrepresentation, (b) offences under the Computer Misuse Act, and (c) criminal damage. I intend to seek damages for the hardware, and also for all licence fees for other (non-MS) software held on the damaged machine. After being told I would have to buy a new Windows Licence after upgrading my motherboard I told MS where to go. Now a very happy Linux user. I paid for the software, and I don't appreciate being accused of being a thief every time wga checks I'm telling the truth. The WGA tool is a complete blunder. First when it installs its self it claims to be a component of windows update more so than WGA and is misleading. Secondly it does not work. Windows XP does not allow you to upgrade effectively. If you changed from an AMD to and Intel CPU it would almost certainly break. You would reinstall it and use the same key. You would then go to windows update which would then say the key has been used on two PCs when all you have done is upgrade. So it's up to you, you can spend £100 extra everytime you upgrade your system to pay for a new key or not be able to update windows or get extra pieces of software for it that require WGA. I'm shocked that nothing about this SERIOUS issue has been mentioned in this article. Well, if that is not a good reason to free yourself from your enslavement to Microsoft and try out free OSes like Linux or FreeBSD, I don't know what is ! I have always suspected that my copy of Windows XP Professional was not an original and I was proved correct when I downloaded the tool. The only annoyance I find is that it reminds me of the fact EVERY time I log in and makes me wait a few seconds before I can access my desktop. I can't understand where the "confusion" is that people are having and I really can't blame Microsoft for safe guarding their product. I can understand checking a machine once, even I dislike it, but there is no reason for the software to continue to "phone home" again and again, unless it's to soften people up for subscription services or it's doing other types of monitoring. You forgot to say in your article that once a system has been identified as fake, it cannot download the updates. WGA is not a problem in my opinion, what is a problem is having to persuade a support person to re-activate the licence after a hardware update, or an re-install when you own a genuine copy. Further more shops like PCWorld selling Windows XP Pro for over £250.00 compared to prices at retailers who don't take advantage of consumers and sell XP Home at £60, and XP Pro at £90 doesn't exactly encourage people to pay for the software they need in order to use the basic features of a computer. If Microsoft really want to combat piracy and stop the use of counterfeit copies, they should lower the extortionate prices of the genuine versions so everyone can afford them. People can't afford to be spending £50-£100 or more on one piece of software every time they update. Especially when most software for all other playforms comes in at less than £35 at the highest. If you own a genuine copy then you should get free upgrades for life in my opinion. Yeah I had a counterfeit copy off the web. When WGA started complaining I downloaded and installed a patch to remove it. Over the past two months or so I've noticed small windows updates being attempted on the systems we have and that on at least one of them it failed to install and has tried to reinstall WGA on numerous occasions - personally I think that it's a glitch with the WGA tool, MS needs to do more thorough QA checks before sending out updates, lately they've been causing problems for us legitimate licence users let alone the users of pirated software. Lordy - I'm glad I don't run Windows then. I wonder how this works with computers that are not hooked up to the internet. Will the app cause Windows to just stop if it can't contact Microsoft online? I haven't heard of anyone who's had problems with WGA. However I can imagine people who own systems that were installed with a generic key code or corporate key code may have problems due to the fact the code on the sticker doesn't match the code in the operating system. I have also read a lot about WGA reporting what software and hardware is on the computer. The whole tool used by Microsoft including the Activation software is dreadful! I have a genuine copy and EVERYTIME I install the software on my PC I have to phone through for the code to activate the software...and there was me thinking it was meant to help genuine users!